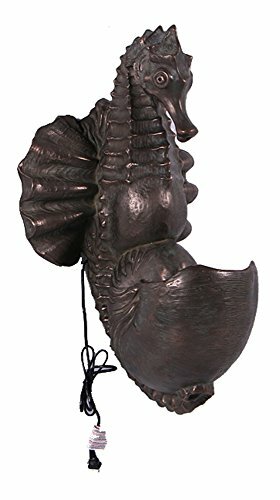 This 30" Seahorse Wall Fountain - Verde Bronze Finish is ready to be hung on your wall as a statement piece! Made of lightweight, sturdy fiberglass resin, this piece measures approx. 30"H x 17.75"L x 16"W. Gorgeous, hand-rubbed bronze finish that is suitable for both indoors and outdoors use, however, if placed outside, the piece will patina like a real bronze piece. Features gorgeous detailing to make this fountain unlike no other you've ever seen! The water pump is not included with this piece - you will need to purchase one separately. Mounts easily to the wall using the provided key hole at the top in the back.